Acknowledged by so few for such a long time…. Elizabeth “Mumbet” Freeman is not mentioned in the publication Notable American Women (1971), a three volume biographical dictionary which is the first full-scale scholarly work of its kind. Mumbet is not mentioned in Merriam Webster’s Biographical Dictionary (1995). She is not mentioned in the National Women’s Hall of Fame. However, since 1999 when the mumbet.com website began, the internet has spread the word about Mumbet and her story and is being repeated all over the internet with very little acknowledged to mumbet.com for spreading the message about Mumbet. Very few web sites who acknowledge Mumbet on their websites will acknowledge that their source of information came from mumbet.com. Such is the nature of human beings. At mumbet.com we acknowledge where the source of the information we publish comes from, doing this longer than any other website that mentions Mumbet. Mumbet’s rightful place in history is now being acknowledged by scholars, the media, websites and with the public in general. mumbet.com has been instrumental in this movement to have her recognized. For example, in 2014, biography.com lists Mum Bett (Elizabeth Freeman) and PBS acknowledges Mum Bett. The mumbet.com website has changed to elizabethfreeman.mumbet.com which aptly describes her name. Of course, we still retain ownership of the domain mumbet.com. Mumbet has been known in Berkshire County Massachusetts for a long time and her story is documented and researched by scholars and is the subject of several books. One day Mumbet will be famous, a household name, just as famous as Daniel Boone, Davy Crocket or John Henry. There is a movement to put her portrait on a stamp. Mumbet is in the Smithsonian’s NMAAHC! This site will help others to learn why Mumbet will be a television mini-series, a movie and eventually a famous American Folk Hero. Colonel John Ashley of Sheffield, Berkshire County, Massachusetts, acquired Mumbet and her sister, Lizzy, from their owner, a Dutchman named Pieter Hogeboom, upon his marriage to Hogeboom’s daughter, Annetje (Hannah). The event, according to folklore, which prompted Mumbet to sue for her freedom occurred when the mistress of the house, Mrs. Ashley, attempted to strike Mumbet’s sister, Lizzy, with a heated kitchen shovel in the Ashley House. Mumbet blocked the blow, but her arm was injured and she never regained its full use. According to novelist Catharine Maria Sedgwick, Mumbet was prompted to seek freedom after hearing the Declaration of Independence spoken, and according to historian Arthur Zilversmit the people of Berkshire County then adopted Mumbet’s cause to test the constitutionality of slavery following the passage of the new state constitution. 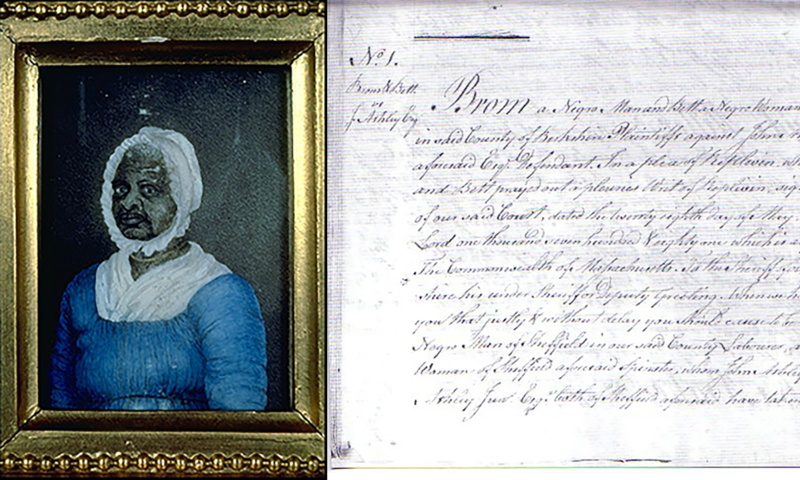 ‘Brom and Bett’ were the first enslaved African Americans to be set free under the new Massachusetts State Constitution of 1780. Mumbet is without a doubt the first black woman in the United States to be set free from enslavement due in large part to her own determination and character. After Mumbet was set free she chose the name Elizabeth Freeman and began working in the Theodore Sedgwick family as a paid servant, first in Sheffield, and later, when the family moved to Stockbridge. She became a surrogate mother to the children of Theodore whom affectionately called her Mumbet. The book, One Minute A Free Woman: Elizabeth Freeman and the Struggle for Freedom (2010) by Emilie Piper and David Levinson claims that “Lizzie” being Mumbet’s sister is uncertain. The authors are fairly certain from archival research that Lizzy was in fact her daughter. The authors also point out that even though W.E.B. Du Bois claimed he was related to Mumbet, the genealogical studies show Mumbet was not. The authors studied whether Elizabeth Freeman was married to a man who served in the Revolutionary War and found that records show she was never married (the court record describes Mumbet as a spinster). So Brom could not be Mumbet’s common law husband. The authors also claim that Elizabeth Freeman was not the first black woman to win her freedom and instead claim Freeman was the first in Massachusetts to sue for her freedom on constitutional grounds and win, thus helping to end slavery in Massachusetts. The book also introduces many new, rich details about this exceptional woman’s life that heretofore were unknown. And it sets her story in the context of her times and her home sites, as well as following her descendants through the years. While the authors have changed the story (just a bit) that has been told for years in Berkshire County there will be without a doubt other researchers and authors stimulated to uncover the facts and add more to Mumbet’s story. Without a doubt more information on Mumbet will continue to be dug up by scholars, historians and authors which will be published on this website and acknowledging the source. A movie is in development and, finally, Mumbet is in the Smithsonian’s NMAAHC! Since 1999 mumbet.com is the official site for Elizabeth Mumbet Freeman, one of the first black women to win freedom in the USA, at the very least the first black woman to win her freedom in Massachusetts. The webmaster lived in Housatonic and Great Barrington for almost ten years and became acquainted with the story of Mumbet, visited the grave, and quickly saw how important Mumbet’s story is in US History and registered the domain. This site has grown over the years and many have contributed to the knowledge of Mumbet by posting in a guest book as well as emails sent to the webmaster. mumbet.com has been instrumental in publishing knowledge of Mumbet and without a doubt has contributed to those who now acknowledge Mumbet’s rightful place in US history. For example Wikipedia didn’t even exist when mumbet.com began publishing. Wikipedia finally added Mumbet into its database citing mumbet.com at least once. There is a movie in development! This web site is the official site dedicated to Elizabeth ‘Mumbet’ Freeman, the longest established, while other websites have simply mimicked and copied the information and images from mumbet.com, without ever acknowledging mumbet.com as their source. Nevertheless, mumbet.com without a doubt has published more knowledge about Mumbet than all the others combined. We ask if you use the information on this website that at the very least you acknowledge your source of information and credit mumbet.com. In January 2018 we changed the name of the site to elizabethfreeman.mumbet.com which clearly focuses on her name. Mumbet will be taught to children in school along with Daniel Boone, Davy Crockett, John Henry and other famous American folklore heroes. May you enjoy learning about this remarkable notable woman who without a doubt will become as well known as other famous folklore heroes.